The thymus is a lymphatic organ that was often thought of as an organ of mystery by the ancient Greeks. A soft, pliable lymphatic organ positioned in the anterior superior mediastinum, it does not compress or displace the adjacent structures. 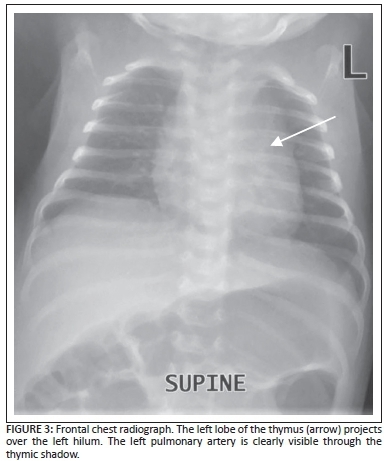 It is disproportionately larger in the paediatric population and then gradually regresses to 'hide' in the mediastinum as the child advances into puberty. It regresses in size under conditions of stress and may be absent in various congenital abnormalities such as DiGeorge syndrome and conditions of stress. 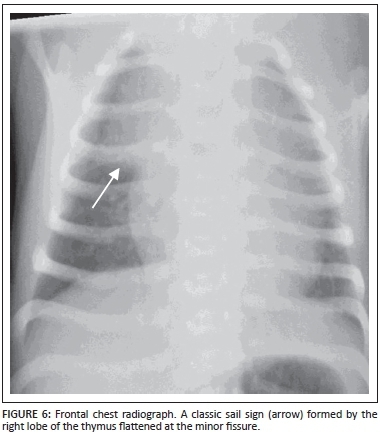 The thymus appears in a variety of shapes and sizes on a paediatric chest radiograph and at times may be misinterpreted as pathology. 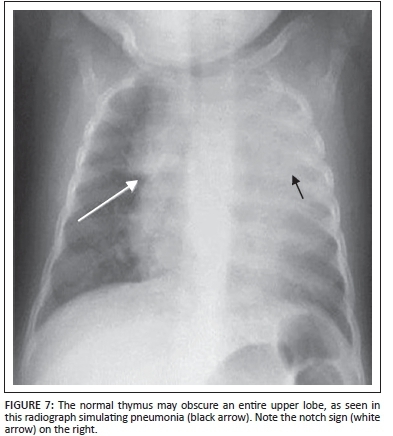 This article describes the normal thymus as it appears on paediatric radiography, and addresses mimickers. The thymus is a lymphatic organ that has an important role in the development of the immune system of the body, especially the T and B lymphocytes, which in turn play a major role in cellular and humoral immunity respectively. 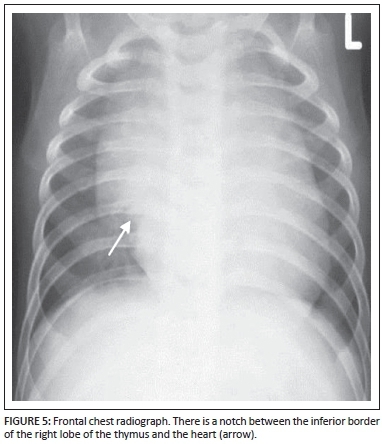 Despite the advances in imaging technology, the fear of radiation in children means that the chest radiograph remains the imaging modality of choice in paediatric patients. 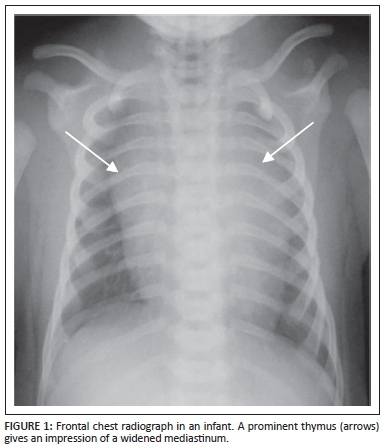 The thymus on the radiograph lies in the anterior mediastinum, overlying the pericardium, aortic arch, left innominate vein and trachea.4,5,6,7 There are numerous variations in the size and shape of the thymus on chest radiographs that are often misconstrued as pathology. A basic understanding of the anatomy and physiology of the thymus is helpful in the radiographic interpretation of its variations in chest radiography. 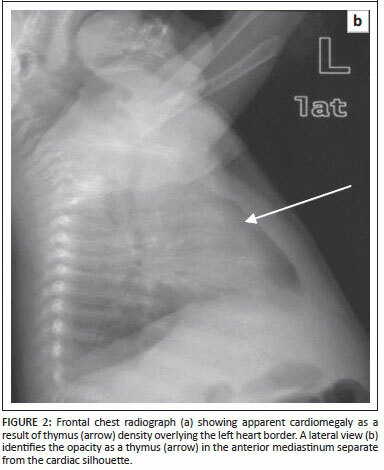 Prominence of one or more lobes can simulate cardiomegaly on frontal radiography (Figure 8) that can, however, be seen to be thymus on the lateral radiograph. 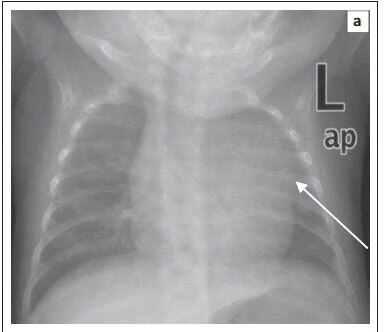 Normal thymus may obscure or simulate upper lobe pneumonia (Figure 7).4,7,8 Sometimes the presence of other pathologies may cause the thymus to appear abnormal, as seen in pneumomediastinum or pneumothorax where the thymus has been likened to 'angel's wings' or 'spinnaker sail' (Figure 8). 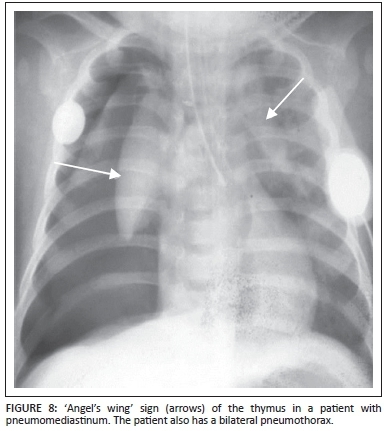 Pneumothorax, when under tension, may cause displacement of the thymus, disguising it as an abnormality (Figure 9). 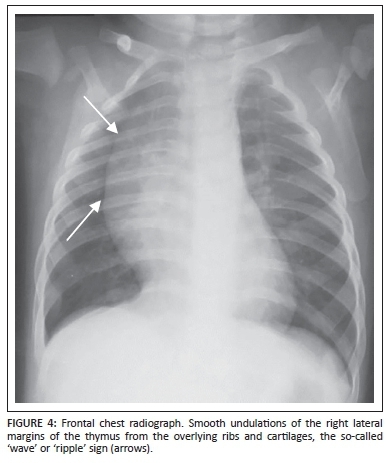 It is important for the radiologist and paediatrician to empirically recognise and differentiate normal thymus, its variants and mimics from pathology on a chest radiograph. A thorough knowledge of its anatomy and dynamic changes through life is essential to prevent errors in diagnosis. In cases of diagnostic confusion, imaging modalities such as ultrasound, computed tomography (CT) and positron emission tomography (PET)-CT are available and useful in differentiating thymus from other anterior mediastinal masses. N.K. (University of Pretoria), D.C.T. (University of Pretoria), F.S. (University of Pretoria) and I.V. (University of Pretoria), contributed equally to the writing of this manuscript.